Here are some interesting facts about the Spanish language that will arouse your curiosity. Spanish is the mother tongue of an estimated 400-450 million people, making it the world’s second most spoken language. Spanish only falls in second place behind Chinese, which is spoken by over a billion people and far outranks any other language. Spanish surpasses English in its number of speakers, as English comes in third place with 335 million native speakers around the world. Spanish enjoys official language status in 21 countries across Europe, Africa, Central, South and North America, making it a very important global language. Not only is it the main language for these 21 sovereign states, it also serves as a key language in a handful of dependent territories. For many people in these places, it’s the only way to communicate and all official correspondence and documents are in Spanish. Spanish is also used in schools to teach the curricula. Since English is spoken in 112 countries, the English language is the most widespread in terms of the number of countries that speak it. French is second with 60 countries speaking the language and Arabic is third, with 57 countries who communicate in Arabic. Sure, Spanish only comes in fourth place in this aspect, but that still results in making it one of the most significant languages in the world. Many international companies and organizations, including the United Nations, have adopted Spanish as one of their official languages. Spanish belongs to the Indo-European languages, which include French, English, Russian, German, the Slavic and Scandinavian languages as well as various languages in India. Indo-European languages initially spread across Europe and many areas of South Asia before reaching other parts of the world through colonization. The name “Indo-European” has a geographical meaning relating to the languages’ most easterly reaches in the Indian subcontinent and their most westerly reaches throughout Europe. Spanish is further classified as a Romance language, along with Catalan, Italian, French, Portuguese and Romanian. You probably already knew about Spanish being a Romance language on some level, but the importance of this goes deeper than you might expect. All these intercontinental connections give Spanish a distinct advantage. Knowing its roots in and relationships with other languages can help you better understand Spanish linguistically, historically and culturally. The Spanish language derives from a particular type of spoken Latin. This dialect developed in the central-northern region of the Iberian Peninsula following the 5th-century demise of the Western Roman Empire. From the 13th to the 16th centuries, Toledo developed a written language standard and Madrid followed suit through the 1500s. During the last 1,000 years, the language has become more widespread, moving south towards the Mediterranean. It was subsequently adopted by the Spanish Empire and, just as importantly, in the Spanish colonies established on the American continents. The terms applied can differ from region to region, and they can also reflect political and social views. In English, the term “Castilian Spanish” can be used to refer to individual dialects of Spanish spoken in the northern and central parts of Spain. Occasionally, the term is used more loosely to refer to the Spanish spoken in Spain, as opposed to Latin American Spanish. Most people know a few words of Spanish, such as tapas, siesta, cava and tortilla. Spanish has also borrowed a few words from English, such as los jeans (jeans) and el hotel (hotel). There are, however, some big differences between English and Spanish. For instance, there’s the fact that Spanish is a phonetic language. This means that you pronounce letters consistently and each letter represents a certain sound. This also means that Spanish is a fairly simple language for novices to learn, especially when it comes to spelling and speaking. The links between sounds and letters mean that there usually aren’t any spelling surprises. Of course, you won’t get off that easy. There are a few other tricks for native English speakers to master. As Spanish originates from Latin, it has gendered language—masculine and feminine words and articles. The genders of adjectives must agree with their accompanying nouns, as well as the articles of those nouns. Spanish enjoys more tenses and a greater variation in verb parts compared to English. It also has three ways to address people: tú being the informal “you,” usted being “he,” “she” and formal “you,” and vosotros being the informal, plural version of tú (much like “you all” or “y’all”) in Spain. These all have an effect on verb forms, possessives and pronouns. The Royal Spanish Academy is officially responsible for being the custodian of the Spanish language. It has its home in Madrid and operates numerous language academies through the Association of Spanish Language Academies in the 21 other countries that speak Spanish. The Academy began its life in the 18th century and since then has published dictionaries and grammar rule books, which have been officially adopted in Spain and other Spanish-speaking countries. The Academy prides itself on inventing the use of the inverted question and exclamation marks, which are unique to the Spanish language. Another unique feature it’s responsible for is the letter ñ, which was introduced to the alphabet during the 18th century. We know that Spanish descended from Latin and spread from the Iberian Peninsula to Latin America through colonization. It’s fascinating to know that there are more than a few discrepancies between the Spanish of Spain and that of Latin America. There are also countless differences in the Spanish language within Latin America itself! That being said, the relatively minor vocabulary, grammar and punctuation differences aren’t terribly extreme, and communication is still very easy. You should be able to travel the Spanish-speaking world with “neutral” Spanish and manage communication with nearly anybody. The differences originally arose because the colonies developed somewhat independently from one another, and even from Spain itself. Since communication was limited, with no telephones, airplanes, emails, WhatsApp or Skype, some elements of older Spanish were retained and others abandoned. Plus, you’ll find that many regions have invented their own unique vocabulary, slang, accents and language usage quirks over time. A good example is the way vos is used in Paraguay, Uruguay and Argentina. This is used in the Spanish from Spain, and so it was transferred to the Americas. As alluded to before, vosotros means “you” or “you all,” and thus is the second-person plural in Spain, as it was originally intended to be used. However, vos is now used as a polite, second-person singular pronoun in the above three countries. Spain has long since stopped using it in this way, but if you visit Buenos Aires you’re quite likely to be asked “¿de dónde sos?” (where are you from?) as opposed to “¿de dónde eres?”. Arab armies started to conquer the Iberian Peninsula in 711, bringing Arabic art, architecture and language to the region. Arabic gradually mixed with old Spanish to become the language spoken today. 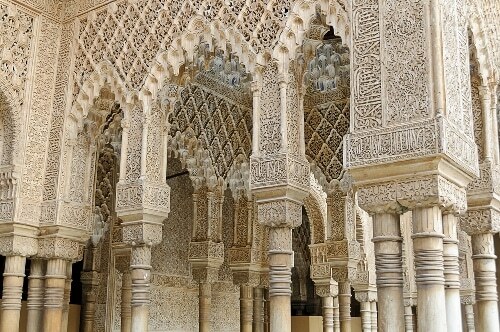 When Spain expelled the Arabs in 1492, the language retained some 8,000 Arabic words. Apart from Latin, Arabic is the largest contributor to Spanish. Many words that you already know in Spanish come from Arabic, such as el alfombra (carpet), la almendra (almond) and la almohada (pillow). When you travel through Spain, you’ll come across many place, region and historic site names that come from Arabic, such as El Alhambra. 10. The earliest Spanish texts were written over 1000 years ago! Las Glosas Emilianenses (Glosses of Saint Emilianus), written in 964, were long thought to be the first written Spanish texts that survive today. They consist of Spanish and Basque notes made on a religious Latin manuscript. The unknown author is thought to have been a monk at the Suso monastery. In 2010, however, the Real Academia Española announced that the first examples of written Spanish exist in 9th-century medieval documents known as the “Cartularies of Valpuesta,” from the Burgos province. When you translate from English to Spanish, your text is likely to expand by 15-25%. This isn’t because Spanish words are longer than English words (and they’re definitely not as long as German words can be). The reason for this expansion lies in the fact that Spanish is more detailed, poetic and expressive. It thus uses more words to describe something that English would probably sum up in just one word. For example, the phrase en el sentido de las agujas del reloj literally means “in the direction of the needles of the clock,” but in English Its “clockwise.” Spanish doesn’t have a word for “clockwise” and has to use the aforementioned phrase! Spain has always been a popular travel and foreign study destination. Studying Spanish in schools and universities has also grown in popularity. These days the language is becoming very popular in Asia, signifying its importance in global economic markets. The use of Spanish online has risen by an incredible 800% in recent years and this means it’s the third most popular language on the Internet, not far behind Mandarin and English. An estimated 18 million students are currently studying Spanish as a foreign language. Forecasts indicate that, in a few generations from now, 10% of the world’s population will understand Spanish—whereas the number is currently 6%. That’s a big leap coming! These fascinating facts about the Spanish language reveal the language’s long heritage as well as its importance and growth in the world today.